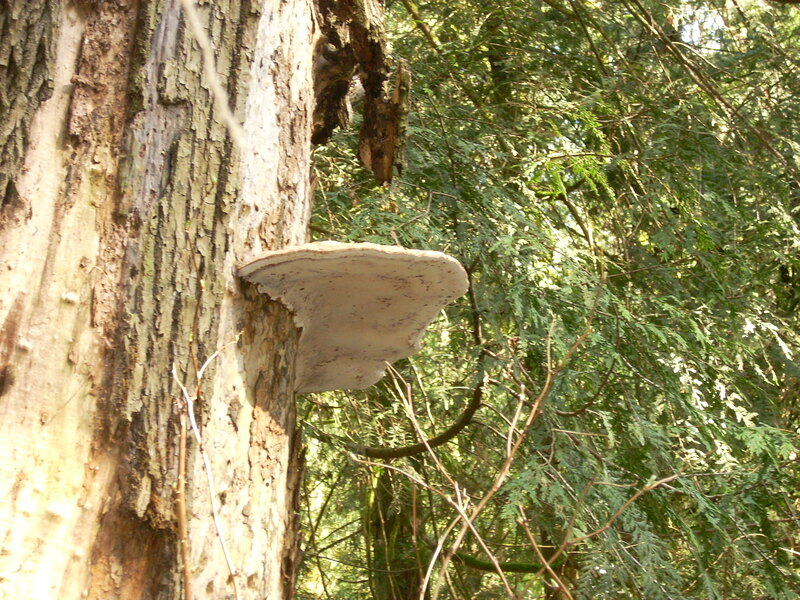 Finally in these last weeks of March, we are getting nights without frost and I am starting to see a few other species other than polypores. 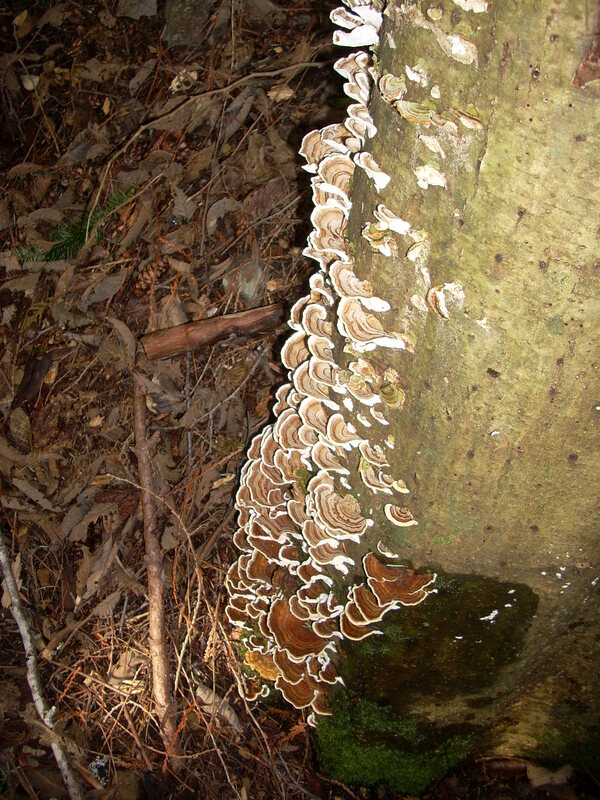 Now don’t get me wrong, I have nothing against that whole family of fungi, as many of them have great healing powers and have been used by traditional healers for millennia. 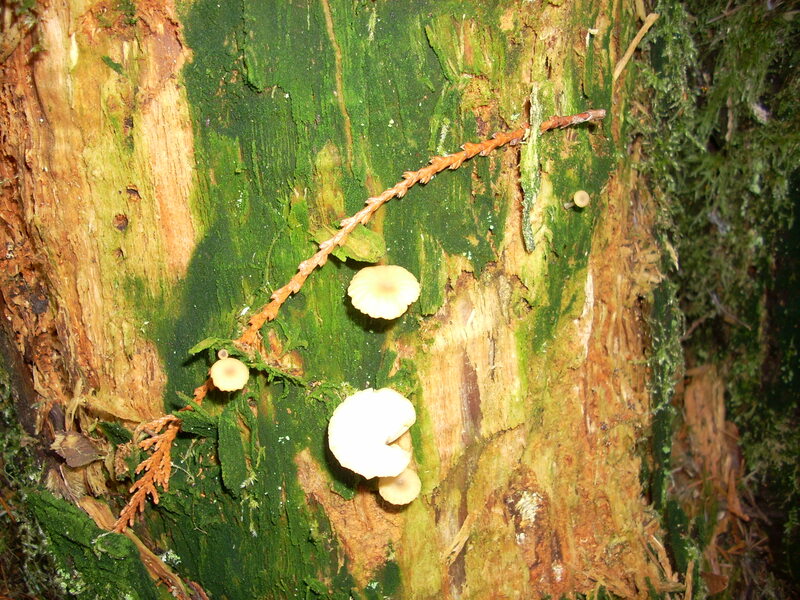 In my recent daily wanderings, I have started to see some of the first soft bodied beauties peeking out of the moss and hidden under the edges of logs. What I have started to see is the Lichenomphalia umbellifera, or also known as the lichen agaric .. 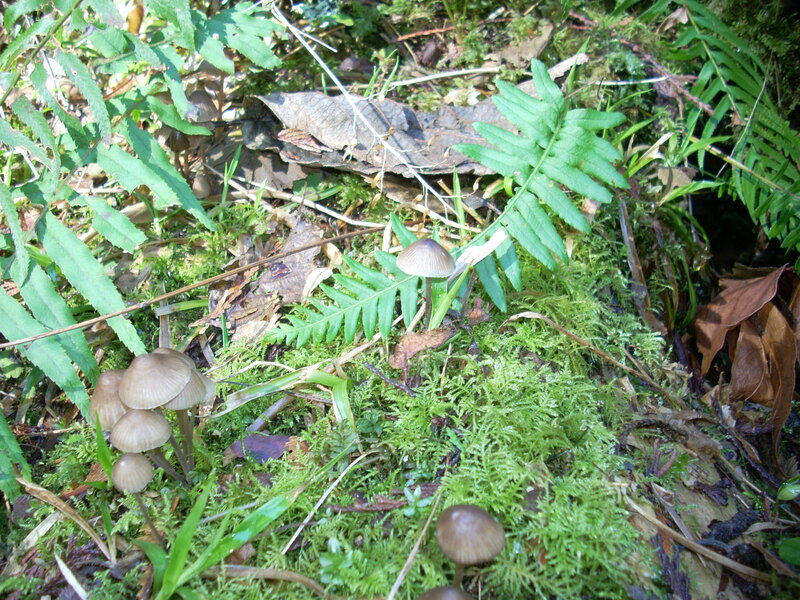 The most common sighting this month is what I believe to be the Psathyrella gracilis group or the graceful Psathyrella.. But hold on for a minute…. I said in my last post that I would do a review of my newly acquired GPS! Why this model? 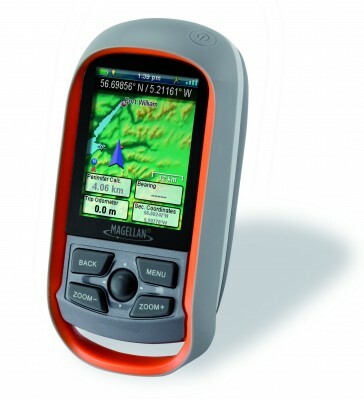 – First off, the price and secondly from on-line reviews, most reviewers preferred the Magellan line to the Garmin GPS’s. Thirdly, the reviewers also stated that this was a good basic entry level unit and easy to use. That last reason, easy to use, maybe so for more technology savvy teenagers, but for us slightly older users, a much steeper learning curve. Why buy a GPS at all? Primarily fear and embarrassment of getting lost in the woods and having to get the SCSAR come out and find me. Also,to give me more confidence in getting back home, especially when I am taking newbees in to the woods on forays. But to be totally honest, I have always wanted one so that when I find that bonanza patch of chanterelles, I can mark it as a way-point. You store the way-point in the GPS memory, then when you want to find the patch next year,you just have to retrieve the information and follow the track to where those beauties are likely to return. 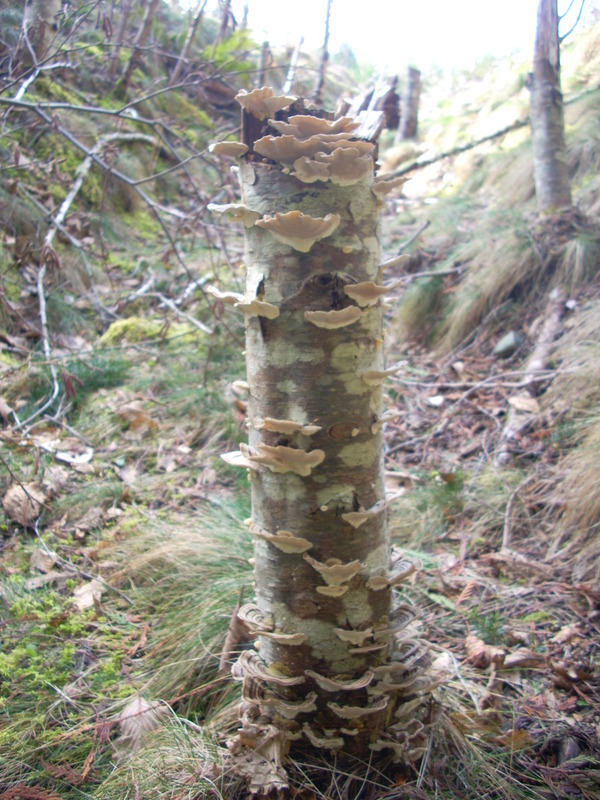 This trick I haven’t tried, as I haven’t found that bonanza patch of chanterelles yet. How easy is it really to use? Well, the unit comes in a box, with two AA lithium batteries and a very short instruction manual… the quick start version. I guess for those more “technologically savvy teenagers” which basically tells you how to put the batteries in, but doesn’t actually tell you were the on-off switch is. After pushing several of the buttons on the front of the unit with no success, and thinking to myself, if you can’t even turn the unit on, how will you use it to find your way home? I finally notice one of those “soft” switches on the top of the unit, the ones with the circle with a line through it, and the light went on!! !Press here.!!! So it powers up and the screen lights up, then like most men, I started pushing buttons not knowing what I was doing or what the different screens meant. Back to the basic instructions manual and I see that there is an on-line user manual I can access. Off I go to the web and find the manual… all 30 pages of it. It seems to me that any technology that needs a manual 30 pages long to instruct you how to use it, is not a good basic entry level tool. The other thing is I guess I am kind of old school and find it easier to learn something from a book or manual held in my hand. However, because it saves many trees being killed, I embraced the e-manual and began to study it. After several re-readings of the manual, I figured out how to turn it on and of and how input my name and phone number in the unit (I guess if they find the unit next to your bleached or possibly moss covered bones they can pop in a new set of batteries and find out who you are). More study and I then learned which buttons were pressed first and which next to get the map, the compass, setting a new track, setting way points and then how to retrace your track back home. Also, I purposely took the wrong turn to learn what the unit does to tell you, “you are lost!”. The track changes colour and the little arrow on the map that shows your position, goes from green to red. To get back on track, you turn around and head in the direction the arrow now points. Once back on the right track, the arrow turns green. Kind of simple, but effective. There is also an alarm that you can turn on to indicate when you are off course or close to a pre-set way point. I need to do more reading and experimenting before I learn how to turn that function on. Overall opinion – generally, I think it will be a great tool to use, once I get used to it and finally understand all the functionality built into the unit. The down side is the small, screen, which is only 2.5 inches by 2.5 inches. My old eyes are not that good anymore, however, there is a zoom function when in the map mode, so that way you can zoom in and zoom out to get a better perspective of your terrain. The unit has a very good compass, that includes the position of the sun and moon on the screen to help you get oriented even deep in the woods or on a gloomy rainy day. If all you need is a compass and a map, then you have a very expensive one, but cool. Also included is a very good altimeter, odometer and trip timer to clock your distance, speed and change in altitude. After three weeks of ownership, I am getting less frustrated with the technology and more enamored with the functionality. In conclusion, I now think it was a good choice and as I learn more of the functionality, I will let you know. Hi all.. just got a request from another mycophile who was interested in growing her own. So I posted this information on our SCSHROOM Facebook site https://www.facebook.com/scshroom . If anyone else lives in the Greater Vancouver region, check out this site. As a society, SCSHROOM has sold these starter kits at our festival and I myself have grown both the shitake and oyster mushroom kits and they were easy and very productive. Well March started off kind of cold and wintery, but boy has it been nice the last week or so! I hope this means an early spring and early fruiting of the spring time edibles. 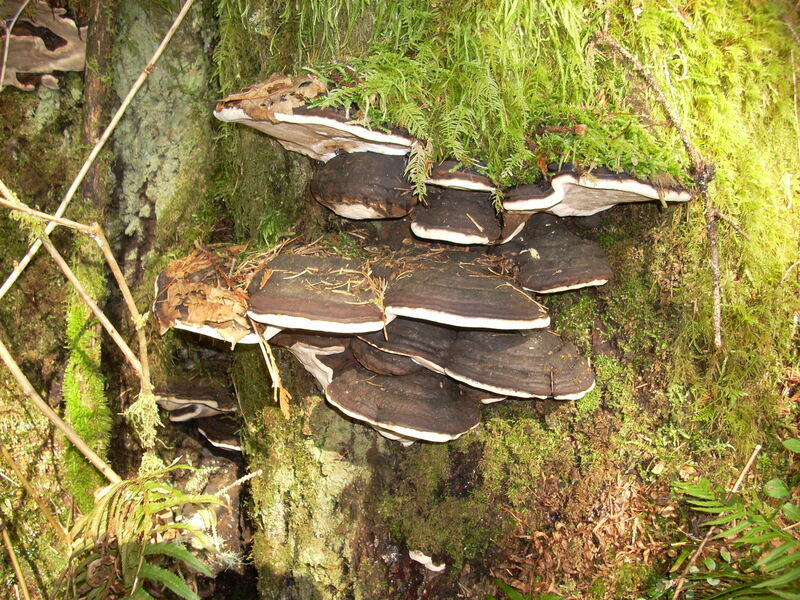 and the oyster mushrooms (Pleurotus ostreatus). Now don’t get too excited as the pictures of these two delicious examples are from last year. Last year was an absolutely incredible year for oyster mushrooms as I must have picked 20 pounds or more and they were everywhere I went looking. However, when it comes to my other “choice” mushrooms, morels, so far, here on the coast I have found only a total of 6, yes 6 morels in the last three years! They don’t seem to be as common here as they are elsewhere in British Columbia. 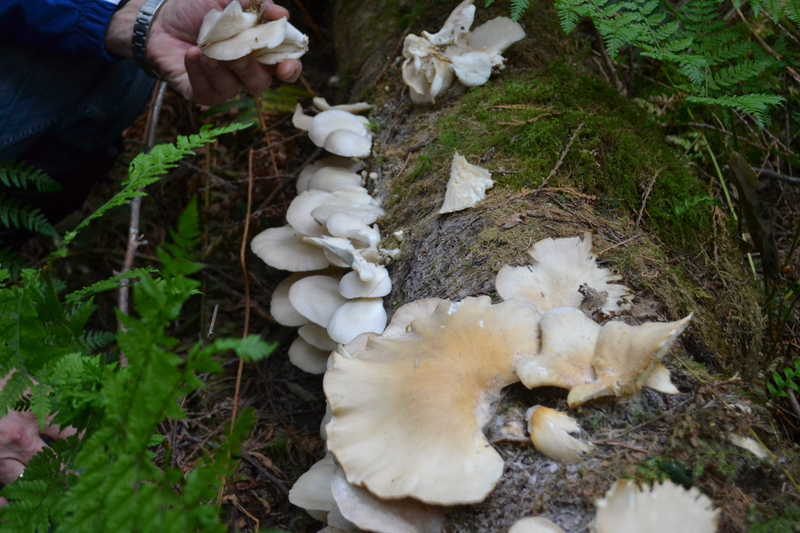 A friend who use to pick mushrooms commercially with her husband on Vancouver Island, tells me of one year when they picked hundreds of pounds of them. I have yest to meet someone here on the Sunshine coast that has ever found that many. When I was young and growing up in Saskatchewan, my father and I use to pick many pails full of them. There never seemed to be a lack of them. The black morel is also known as the fire morel. 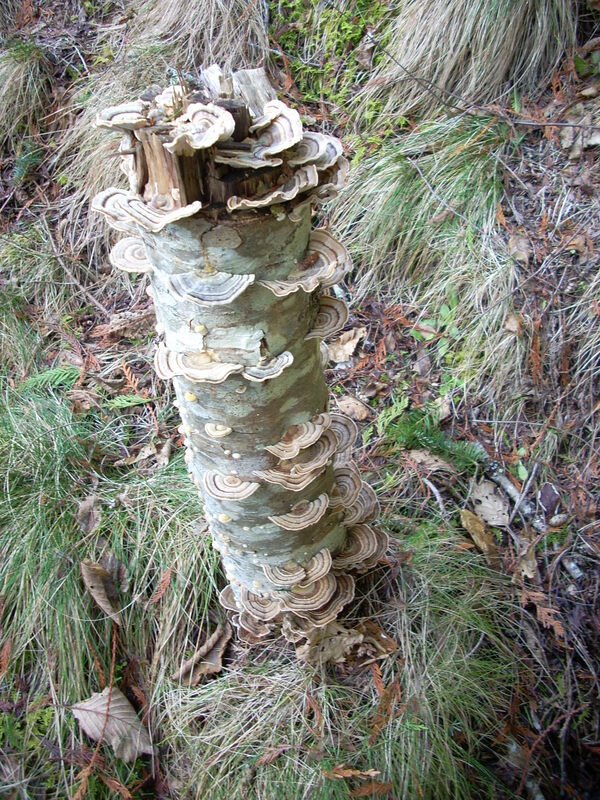 Often there are huge flushes of morels in areas the year after a forest fire. From my reading about this species, morels are one of the pioneer fungi that go in and start the process of remediation of the debris left over after a fire. They also like a soil that is less acidic, which soils after a burn tend to be. Another friend found morels growing around her fire-pit last year were they had never grown before. The story is that one of her friends, who is an avid mushroomer, took some of morels that were too old to eat or dry, blended them up in some water and inoculated the fire-pit. 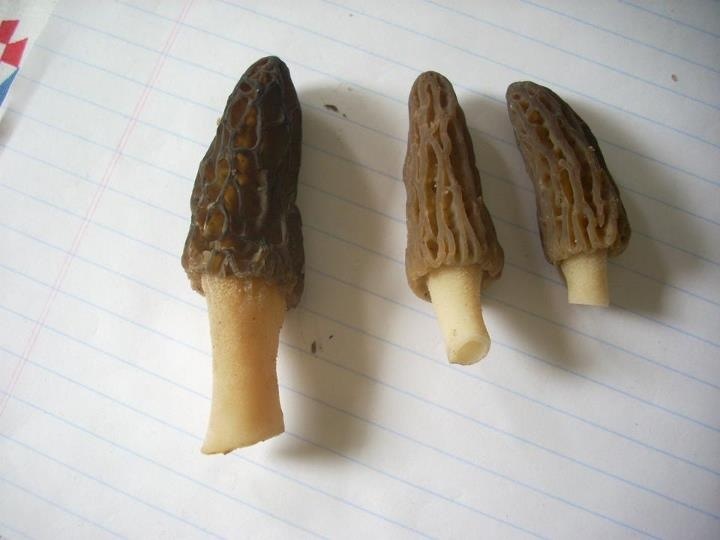 Walla….morels growing the next springs in the ashes of last year’s bond fires. I will talk more about this “inoculation” process in a future post. Back on track now as to what I am finding out there this month. 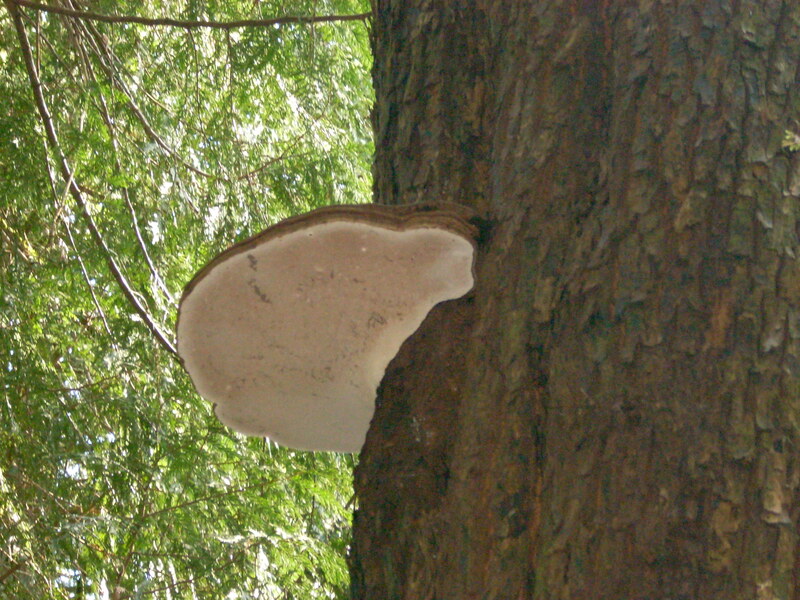 So far the sightings of soft bodied fungi have been few and far between, though the hardier polypores are there in great numbers. 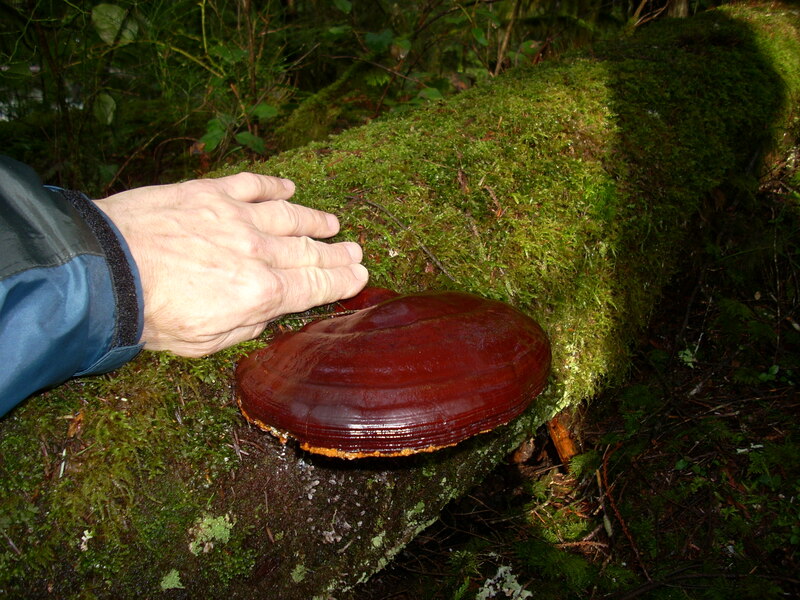 My other find this month was a number of old but beautiful Ganoderma tsugae (varnish conk;cedar lacquer fungus;glossy ganoderma) which many mycologists are now thinking may be part of the Ganoderma lucidum complex which is the Reishi mushroom of renown healing properties. 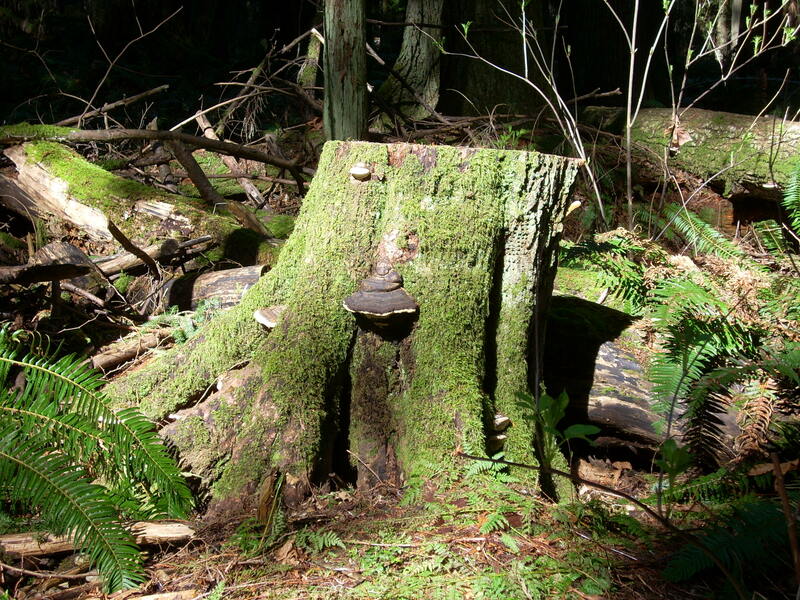 I intend to return to this log next fall to see if I can find some fresh examples. 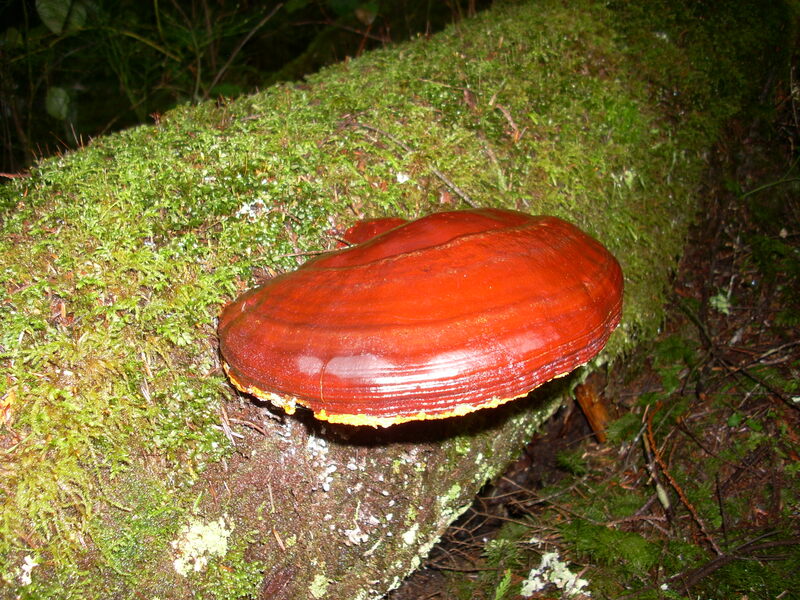 This fungus only grows on the trunks of hemlock, western larch and occasionally Douglas fir in the mountains of British Columbia and down the coast. Robert Rogers when visiting last fall talked about a craft brewery in Teluride that decided to brew an ale that used the Ganoderm tsugae instead of the usual hops as the bittering agent specially for the mushroom festival. From Roberts report, it was very well received by people. I may take a group down to this area this spring and fall as the habitat looked very promising for the ploypores as well as other species. There is a good mix of deciduous, especially standing dead alder and a lot of wind broken limbs on the damp forest floor. 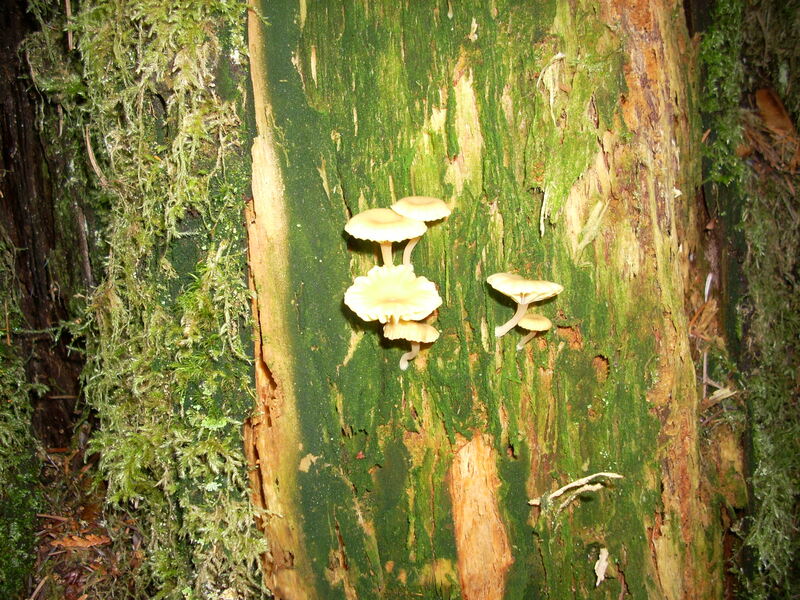 These are all good signs that this may be prime oyster mushroom territory. 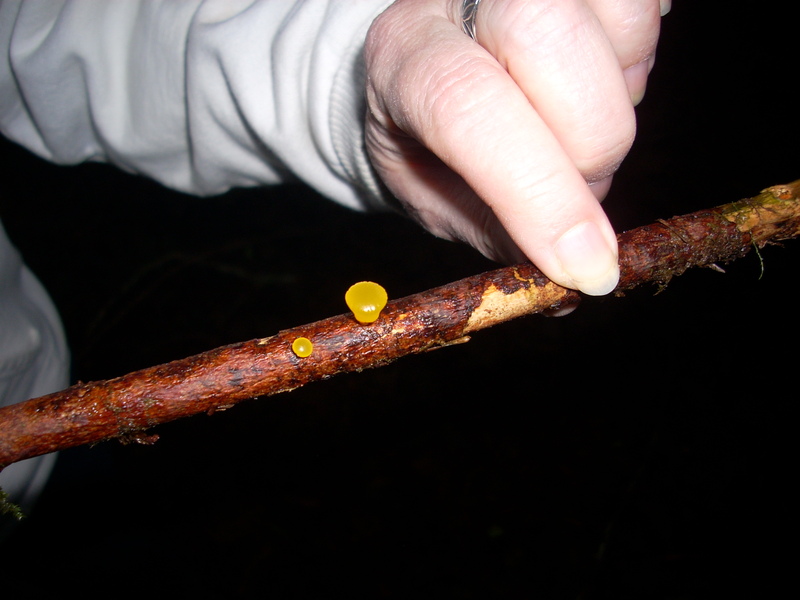 One other find on that walk was the Golden Jelly Cone (Guepiniopsis alpina)..
My next post will be a review of my most recent purchase, which is hand-held GPS unit. I was vacillating between a new and better camera or a GPS unit. I had been watching the fliers for sales for the last year or so, doing my on-line reviews of the different products out there as well as comparing price and value. I finally did the deed and bought a Magellan eXplorist 310. Why you ask? Primarily price ( less than $150) and also my plan is to use it to mark my finds with way-points , as well as help me get out of the bush safely. I may even go a bit deeper into the woods now, seeing as I have a way to retrace my track back to where I left my truck. But more of that later. There is still almost two weeks left in March, so I am hopeful that there will begin to be an explosion of diversity in the fungi kingdom in the coming weeks. Get out there and start looking. Hope to see you on the trail some day soon.